The Montecristo Churchill Anejados is the second release of the linea Anejados. The Cigars released under this line are extra matured in the perfect humidity conditions of Cuba for a period of time between 5 to 8 years. This extra aging allow each part of the cigar to really melt together releasing the very full flavor potential of the tobacco leaves. You can also read the great review of the Partagas Corona Gordas Anejados here! 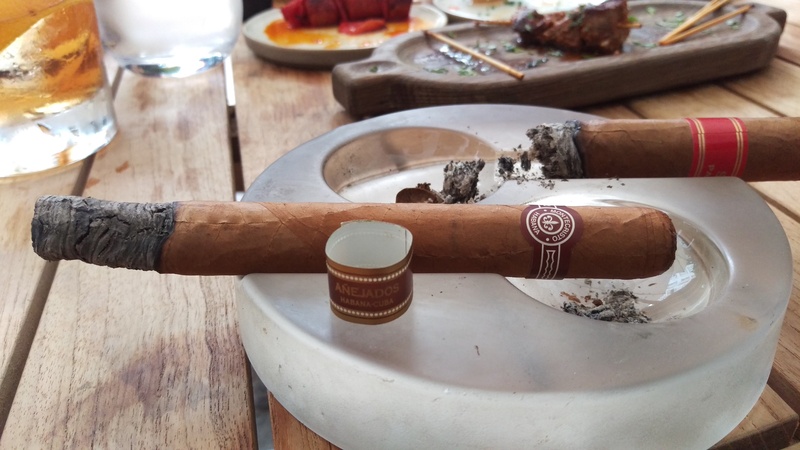 The Montecristo Anejados shows a double band, the traditional one plus a brown one which proudly said Anejados indicating the extra aging indeed. The size which I particularly like is elegant and its already a pleasure to old it in your hands. The color of the wrapper is Colorado and the quality of it is excellent with not many vein coming out and a crunchy feel which make me hope in a good draw. The cigar is been rolled well, the cup was applied correctly facilitating the cutting procedure and the pre draw announce that is not going to be a tight one. During the smoke the ash was very compact and I almost went half way through before it went down, and when it did I could see the core of the cigar perfectly lit as I never had to use the lighter again. 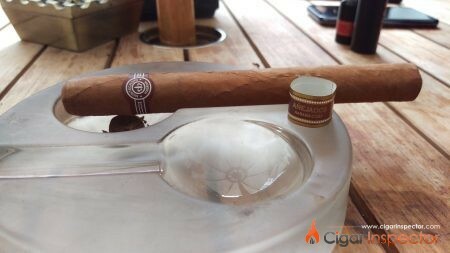 Like a first date, it is a shy beginning for the Montecristo Anejados, it felt quite light as a start but on the other side combustion and draw were really good. It shows since the beginning that the character of the stick is going to be woody with some spices hints, the classic Montecristo profile. As we reach the second third the flavor intensity definitely picks up as the smoke gets warmer and denser, we can appreciate the lovely cedar and oak wood, vegetal notes with some cashew nuts feeling as well and a hint of spices occasionally. Close to the end we can really appreciate the definition of the flavors, which are not changing much since the beginning, the only thing that evolves is the intensity of those, which is totally normal as the burning spot is always closer to our palate and the smoke is hotter; combustion and draw have been great during the entire stick. The cigar was a bit lighter than expected, maybe because the extra aging which might have lower down the nicotine level, and make it smoother. It was very well constructed and I have to say that when a cigar doesn’t give any “inconvenient” is already half way to the success. Flavor wise the cigar didn’t show any complexity as the profile was the same from the beginning to the end, what I call a linear stick; but the definition of the flavors and aromas was good. This is a cigar which can be smoked anytime really, I enjoyed it with my coffee during the afternoon, and by the nature of it you can lit it and enjoy it without thinking about it too much.